This is the last vehicle to be designed and produced by Heinkel. It employed a vertical single cylinder, piston ported, 2-stroke engine of 150cc. The alloy barrel had hard chrome lining, a compression ratio of 10:1 and produced 9.5 bhp at 5,700 rpm. The gearbox was three speed twist grip controlled. The gearbox was incorporated in the crankcase. The weight was only 118 kgs against 156 kg of the Tourist, what made the Heinkel 150 an excellent performer. 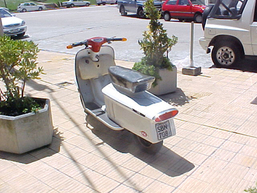 The styling was similar to the ‘Tourist’ at the rear but more like the Italian opposition at the front. It had electric start and fan cooling. No kick start was provided.